Low inflation and soft exports convinced the central bank that now isn't the time to raise interest rates. The Federal Reserve announced today that it still isn't ready to raise short-term interest rates, citing persistently low inflation and concerns about the global economy. Stocks rallied on the news, temporarily sending the S&P 500 up by more than 1%, though the index has since slid into negative territory. In a press release announcing the decision of the Federal Open Market Committee, the body responsible for setting monetary policy, the central bank said that economic activity in the United States is "expanding at a moderate pace." But while household spending, business investment, the housing sector, and the labor market are all improving, net exports "have been soft." The Fed didn't explain why U.S. exports seemed to be lower than expected, but it's reasonable to assume that it has to do with the strength of the U.S. dollar. A stronger dollar increases the cost of American exports abroad. Last month, China devalued the yuan in an effort to prop up its ailing financial sector. 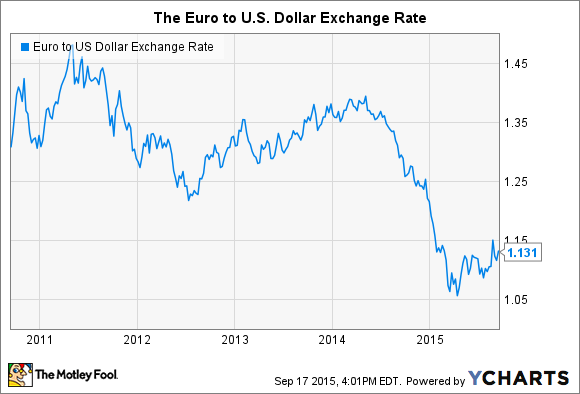 And the ongoing issues in Europe have led to a decline in the value of the euro. Four years ago, it took nearly $1.50 USD to buy a single euro. Now it takes only $1.12 USD. Although the Fed's legal mandate, insofar as monetary policy is concerned, is to maximize employment while keeping a lid on inflation, the value of the dollar plays a central role in both. This is because net exports are one of four variables that determine a country's gross domestic product, or GDP. And the expansion or contraction of a country's GDP is the fundamental driver of both sides of the central bank's so-called "dual mandate." The second issue cited by the Fed for its decision to keep interest rates steady has to do with the dual mandate specifically. "Recent global economic and financial developments may restrain economic activity somewhat and are likely to put further downward pressure on inflation in the near term," reads the central bank's press release. The Fed's objective is an unemployment rate of between 5% and 5.2%, with inflation in the range of 2%. Even though the unemployment rate has reached these levels -- according to the U.S. Bureau of Labor Statistics, it's currently 5.1% -- inflation has yet to pick up. The most recent reading pegged the year-over-year change in consumer prices at only 0.2%, or a tenth of the Fed's target. Taken together, the Fed said that "even after employment and inflation are near mandate-consistent levels, economic conditions may, for some time, warrant keeping the target federal funds rate below levels the Committee views as normal in the longer run." This is great news for the average American, as low interest rates translate into lower mortgage and car payments. But it's anathema to banks like JPMorgan Chase (NYSE:JPM) and others, which stand to benefit from a rising rate environment. JPMorgan Chase estimates that it will earn $7.5 billion more before taxes once short-term rates normalize around 2.25% -- the Fed Funds rate today is between 0% and 0.25%. This is because the yield on JPMorgan Chase's loan portfolio will increase faster in response to an untick in rates than its cost of funds will, a significant portion of which ($430 billion worth) don't bear any interest whatsoever. At the end of the day, then, investors betting on higher interest rates will simply have to be patient.